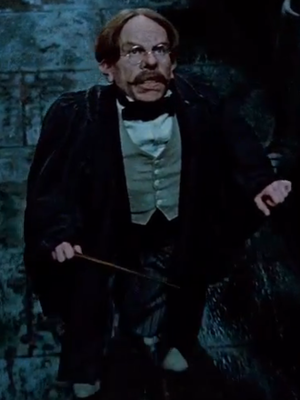 Professor Filius Flitwick (b. 17 October (year unknown)) was a part-goblin, part-wizard who attended Hogwarts School of Witchcraft and Wizardry and was sorted into Ravenclaw House, being an intelligent young man and a model student. Some time after his graduation, Flitwick returned to Hogwarts and became the Charms Master, as well as Head of Ravenclaw House. During the First and Second Wizarding Wars, Flitwick opposed Lord Voldemort. In 1995, he also opposed Dolores Umbridge, the High Inquisitor of Hogwarts, and, in 1997, fought at the Battle of the Astronomy Tower, after which he attended the Funeral of Albus Dumbledore. He also protected the students from the Carrows in the 1997-1998 school year. At the end of the year, he partook in the Battle of Hogwarts and defeated many Death Eaters. He survived the war, and likely continued to teach Charms at Hogwarts to future generations. Filius Flitwick was born into a wizarding family with the distant descent of a goblin. He studied magic at Hogwarts School of Witchcraft and Wizardry, presumably after purchasing his wand from Ollivanders, and was sorted into Ravenclaw House. During the sorting Filius Flitwick had a hatstall with the Sorting Hat, debating between putting him in Ravenclaw or Gryffindor. The Sorting Hat ultimately chose the former. In later life he learned that this was a circumstance that occurred to Minerva McGonagall as well, which the two professors found amusing as had the Sorting Hat chosen Gryffindor for Filius and Ravenclaw for Minerva they may have exchanged positions as Heads of House. At some point, he asked the Grey Lady about the whereabouts of Rowena Ravenclaw's Diadem, which was rumoured to grant the wearer wisdom. However, she denied revealing the information, which she would later relay to a teenage Tom Riddle in the 1940s and Harry Potter in 1998. It was also mentioned that Flitwick, being a model student with nothing to hide, never entered or used the Room of Hidden Things in the Room of Requirement. It is likely that he achieved a high graded O.W.L. and N.E.W.T. in Charms, as later in his life he went on to teach this subject for over thirty years. He also may have taken exams in Defence Against the Dark Arts, as he became a Master Duellist sometime after leaving the school. After completing his Nastily Exhausting Wizarding Tests in his seventh year, Flitwick graduated from Hogwarts and then proceeded to become a Master Duellist and earned the title of "Duelling Champion" at some point. It is also likely Flitwick studied further into magic, becoming an accomplished wizard, masterful in spells, charms, and defensive magic, and even possibly earning the title of "Doctor", and becoming a fully-fledged and educated sorcerer before beginning his teaching career back at Hogwarts sometime in or before the early 1970s. Now back at his old school, Professor Flitwick took up the post of Charms Master. His classroom was Classroom 2E, which was located in the Charms Corridor, on the third floor of the Training Grounds Tower. Professor Flitwick's teaching style was regarded as more "laid-back" than some other teachers at Hogwarts, such as Minerva McGonagall's or Severus Snape's. He, unlike others, allowed his students to play games during the lessons before the Christmas holidays, but he was not a bad teacher as Fred Weasley commented that he "couldn't see old Flitwick getting marked down and he usually gets everyone through their exams alright". He does not hand out many detentions or deduct points often, even for tardiness. Flitwick has a rich sense of humour and is always fair with his students, even those who are not in Ravenclaw . Due to his heritage Flitwick does not discriminate against those of different backgrounds. He also encouraged students to experiment with their own magic and did not generally give detentions for slack work; instead he preferred to give students homework so they could catch up. The only punishment he did give was lines, such as when Seamus Finnigan accidentally knocked him off of his stack of books by letting go of his wand in the air. In 1971, Flitwick taught Lily Evans, Sirius Black, James Potter, Remus Lupin, Peter Pettigrew, and Severus Snape. In 1976, Flitwick administered the Theory of Defence Against the Dark Arts O.W.L. He walked between the hundreds of small desks in the Great Hall during the exam and, once their time was up, ordered the students to put down their quills, but had to tell a pupil named Stebbins twice before he put his down. Flitwick then used a Summoning Charm to collect in the papers, but was knocked over onto the floor when the hundred scrolls of parchments zoomed into his outstretched arms. Flitwick would later go on to survive the First Wizarding War, in which his former students, Lily and James, were killed. Despite these dark times, or perhaps because of them, Flitwick continued to teach at Hogwarts. Professor Flitwick, now in his elderly years, was still teaching at Hogwarts during the 1991–1992 school year. Just before the start of the new school year, Albus Dumbledore trusted him to contribute to the defences of the Philosopher's Stone Chambers. Flitwick, being the Charms Master, enchanted a considerable amount of Winged Keys to fly through the air. At the start of his first lesson of the school year, he took the register and, upon seeing Harry Potter's name on his register, squeaked excitedly and fell off of his stack of books. Also, Flitwick was very impressed when Professor McGonagall, his friend and fellow colleague, told him that she was giving a Nimbus 2000 to Harry after being chosen to play as the Seeker for the Gryffindor Quidditch team. Professor Flitwick also attended the first Quidditch match of the season; Gryffindor vs. Slytherin. He sat high up in the stands near Severus Snape and Quirinus Quirrell. He looked extremely shocked and worried when Harry seemingly lost control of his broom, as well as when Snape's cloak caught fire, but applauded merrily when Harry regained control and caught the Snitch. Professor Flitwick did not allow his first year class to actually perform any magic until Halloween, and, after some coaching, he gave each of his pupils a feather which they were to levitate using the Levitation Charm; Wingardium Leviosa. The class had been anxious to try this since Flitwick used the charm on Neville Longbottom's toad, Trevor. Hermione Granger, who was paired with Ronald Weasley, performed the spell perfectly and Professor Flitwick happily announced her success to the class. On Christmas Eve, Professors Flitwick and McGonagall were in charge of decorating the Great Hall. Flitwick used a charm, possibly Baubillious, to create golden bubbles to adorn the Christmas trees' branches. He also used live fairies to decorate, which he was rather fond of doing. The hall was noted to look absolutely spectacular. He also attended the Feast on Christmas Day and pulled a cracker with Professor Dumbledore. The Headmaster exchanged his pointed wizard hat for a flowery bonnet and Flitwick read a joke to him, which made him chuckle merrily. As the first year exams approached, Professor Flitwick set the first years homework to learn various spells and charms off by heart. When it finally was time for the tests, Flitwick called his students one-by-one into his classroom and asked them to make a pineapple tap-dance across his desk. He presumably also set theoretical papers, which were to be completed in a swelteringly hot classroom. Once the exams were over, Hermione Granger visited Flitwick in the staffroom, saying that she was worried that she got a question wrong in the theory test. He, unable to help himself, told her in confidentiality that she had gotten one hundred and twelve percent. Professor Flitwick continued to teach during the 1992–1993 school year. During a Charms class, Ron Weasley's wand flew out of his hand and hit Flitwick squarely in between his eyes, leaving a great green boil there, which he presumably Vanished. He also set a piece of homework for his second years to do, which involved using The Standard Book of Spells, Grade 2. One of the first lessons that Professor Flitwick taught during the first term was revising the Levitation Charm. He also taught the second years the Skurge Charm, which Vanishes Ectoplasm, and the Incendio Spell. Later on in the year, Mrs. Norris, Argus Filch's cat, was found Petrified on the first floor. Professor Flitwick was amongst the crowd of students and teachers who saw her there. Not long after, Colin Creevey, Justin Finch-Fletchley and Gryffindor House Ghost Nearly Headless Nick, were also petrified. Professor Flitwick and the rest of the staff arrived at the scene shortly after the discovery and he, assisted by Professor Aurora Sinistra of the Astronomy department, took Justin to Madam Pomfrey in the hospital wing. Near the end of the year, Professor Flitwick, along with the rest of the staff, were called to the staffroom by Professor McGonagall. McGonagall told them that Slytherin's Monster had kidnapped a student and taken them to the Chamber of Secrets. Flitwick immediately let out a squeal. McGonagall told them that the Heir of Slytherin had left another message right under the first, which read; Her skeleton will lie in the Chamber forever. Flitwick burst into tears at hearing the news. It had, in fact, been Ginny Weasley, one of Flitwick's students, and, when Lockhart entered the room, the whole staff turned against him. While all the teachers told him his comments of knowing what was in the Chamber and so forth, Flitwick piped in and said that he had told that he was quite sure he knew what was inside it. The next day, Professor Flitwick was to send his Ravenclaws home on the Hogwarts Express. However, Harry Potter had slain the monster, sealed the Chamber and saved Ginny, so Hogwarts remained open. Instead, Flitwick attended the End-of-Term Feast and applauded happily when Rubeus Hagrid returned from Azkaban, being incorrectly sent there on suspicion of the Chamber openings. Had the Chamber of Secrets not been opened during the year, Professor Flitwick would have had to administer the Second Year Exams. However, at the End-of-Term Feast, Professor Dumbledore cancelled all examinations as a special school treat. Prior to the beginning of the 1993–1994 school year, Sirius Black escaped from Azkaban and Dementors were placed outside Hogwarts for the students' safety. Regardless, Professor Flitwick continued his tenure as Charms Master, along with the added responsibility as the Conductor of the Hogwarts choir. During the Welcoming Feast, Flitwick led a reciting of Something Wicked This Way Comes. Near Christmas, Professor Flitwick went to the Three Broomsticks Inn with McGonagall, Hagrid, Madam Rosmerta and Cornelius Fudge. Together, they discussed James and Lily Potter's deaths, as well as the escape of Sirius Black. When it was said that the Potters used the Fidelius Charm to protect their home in Godric's Hollow, Flitwick explained and described the operation of the spell and the position of Secret-Keeper. During the snowy season, Professor Flitwick taught his third years the Carpe Retractum Charm. While explaining the spell's uses to the class, Hermione Granger arrived late after, having used a Time-Turner to go back in time from a Study of Ancient Runes class with Professor Babbling. This happened again after the Easter holidays when Hermione overslept and missed the Charms class on Cheering Charms. Soon after, Professor McGonagall confiscated a Firebolt broomstick that Harry Potter received as an anonymous Christmas present, and she handed it over to Professor Flitwick and Madam Rolanda Hooch, the Flying Instructor. The two examined it to see if there were any malicious or unfriendly spells cast upon it, since they thought it possible that Sirius Black had sent it to him in the hope of killing him. Later on in the year, Sirius Black successfully broke into the castle and infiltrated the boys' dormitory in Gryffindor Tower. As a defence mechanism, Professor Flitwick taught the oak front-doors to recognise a picture of Black so as to not grant him access. Also around this time, Flitwick set the Third Year Exams, which involved casting the Cheering Charm. Nearer the end of the school year, Black was finally captured and locked inside Professor Flitwick's office on the seventh floor near the base of the West Tower. However, Black vanished that night and escaped from the castle. Professor Flitwick continued his career in 1994 at Hogwarts when the Triwizard Tournament was being held. When the Beauxbatons Academy of Magic and Durmstrang Institute students arrive, he applauded them at their entrances, and, after that, both he and Dumbledore led a presentation of Hoggy Warty Hogwarts by the whole school. At the High Table, Hagrid accidentally stabbed his hand with a fork. He taught the Summoning Charm to his fourth year students shortly before Hallowe'en and assigned three books worth of reading before actually starting. It was this charm that Harry Potter used during the first task of the Triwizard Tournament, which earned him first place. Professor Flitwick later taught his fourth year class the Banishing Charm. He started to ease off his lessons in the week before Christmas and the Yule Ball and instead spent his time talking about the Summoning Charm that Harry had used in the First Task, being a proud Charms Master. During the Yule Ball, Professor Flitwick conducted the Hogwarts school choir in playing waltzes. However, once the dances "heated up" and the Weird Sisters arrived to perform, Flitwick was passed over the heads of all the dancers, imitating what Muggles call a moshpit, yelling at them to let him down. In the Third Task, Professor Flitwick, along with Minerva McGonagall, Rubeus Hagrid, and Bartemius Crouch Jr. disguised as Alastor Moody, was appointed one of the marshals to patrol around the Maze. He wore a shining star on his wizard hat and had to respond to any of the champions cries for help (the Periculum Spell). At the end of the task, Cedric Diggory was murdered, and Lord Voldemort was declared to have risen to power again, and thus the Second Wizarding War began. Flitwick attended the Memorial Feast to Cedric Diggory at the end of the year. The next year, Dolores Umbridge became the new Defence Against the Dark Arts teacher. She quickly arose to become the High Inquisitor of Hogwarts, gaining the power to inspect the teaching standards of her fellow colleagues. During Umbridge's inspection of Professor Flitwick's Charms Class, she sat in the corner of the classroom making notes on her clipboard while he taught his N.E.W.T. students. He treated her like a guest and did not seem to be distracted by her at all, since she hardly spoke, though she did ask Alicia Spinnet what the classes were like. Satisfied with what she had heard and seen, Umbridge left Flitwick to continue his lesson. When Umbridge inspected Professor Flitwick's class with the school choir, she seemed impressed and pleased, but pulled out a tape measure and measured Flitwick's height. He did not seem happy at all and looked rather offended. Once Professor Umbridge had banned The Quibbler from the school after an interview of Harry Potter was printed, all the teachers were proud of him standing up to her. Professor Flitwick, not allowed to talk about anything not relating to his subject, secretly gave a box of Sugar Mice to Harry during one of his classes, before saying "shh!" and hurrying away. Later on in the year, Professor Umbridge became the new Headmistress after Professor Dumbledore left the school. On her first day in office, Fred and George Weasley released fireworks into Hogwarts Castle and some sparklers managed to find themselves in Classroom 2E, Flitwick's classroom. He, wanting to annoy Umbridge like the rest of the staff, ran for her help. Once she had extinguished the fireworks, he revealed that he could have gotten rid of them himself, but he wasn't sure that he had the "authority", before slamming the door in her face. After Easter break, Fred and George used one of their inventions, a Portable Swamp, to change a corridor into a bog and then departed from school to go into the world of business. Professor Flitwick was seen cheering and supporting them at their departure after they ran rings around Umbridge and Argus Filch. Flitwick was asked to remove the swamp they created at the end of the year, which he did, but he claimed to be unable to remove a small patch under a window. He actually left it there as a tribute to what he saw as a demonstration of rather advanced magical capabilities. In 1996, Hogwarts was put under the protection of a group of Aurors. Professor Flitwick, together with the caretaker, Argus Filch, was appointed to check off every student entering the school at the entrance gates on a register and take their belongings to be searched for any dark artefacts or weapons. With every student now in the grounds, Flitwick cast some sort of magical barrier spell on the gates, preventing anyone from entering. When Harry Potter arrived at the castle gates with Nymphadora Tonks, he had to wait till Severus Snape could lift the barrier. One of the first classes he taught to his sixth year class was transforming vinegar into wine. He approached Harry, Ron and Hermione during the lesson and asked them to perform the spell. Hermione cast it perfectly the first time, while Harry turned his to ice and Ron blew his up. Flitwick gave the two boys homework based on their performance, to practise for next lesson. During one of the students' trips to Hogsmeade, Professor Flitwick also visited the village, possibly for security reasons. On his way back to the castle, Horace Slughorn, the new Potions master, invited him to have a drink at the Three Broomsticks Inn, but Flitwick claimed to have "emergency choir practice" and left him. Later on in the year, Flitwick was in the Great Hall with the Hogwarts choir when Death Eaters invaded Hogwarts and Minerva McGonagall ordered him to get Severus Snape. When inside Snape's office, Snape Stupefied him, and told Hermione Granger and Luna Lovegood that he had collapsed and that they should tend to him. Shortly after knocking Flitwick out, Snape killed Professor Dumbledore. Once recovering from his attack by Snape, Flitwick insisted on looking after the Ravenclaws. He also took part in the conversation of whether or not Hogwarts should remain open or be closed, as having the Headmaster killed by one of the staff was a "terrible stain on Hogwarts history." Flitwick insisted that the decision should be made by the school governors, which Minerva McGonagall, the new Headmistress, was inclined to agree with. He also argued that Dumbledore should be buried in the grounds, which had never happened to any Headmaster or Mistress. Professor Flitwick, with the rest of the staff and students, later attended the funeral of Albus Dumbledore at the end of the year in the grounds near the Hogwarts Lake. Prior to the start of the 1997–1998 school year, Severus Snape was made Headmaster of Hogwarts while his fellow Death Eaters, Alecto and Amycus Carrow, became the Muggle Studies and Defence Against the Dark Arts teachers respectively. Despite the school now in the grasp of Lord Voldemort, or perhaps because of it, Professor Flitwick returned to the castle to teach and protect the students. The Carrows were put in charge of all discipline and punishments, although Flitwick and the staff never sent students to them if they could avoid it, as the new professors' idea of punishment included such horrors as the Cruciatus Curse. Near the end of the 1997–1998 school year, Alecto ordered Professor Flitwick to let her into Ravenclaw Tower. He did so, answering the riddle required to enter. When she failed to come out, Amycus told McGonagall to make Flitwick open the door for him too, but she did it herself. That night, Flitwick, with Professors Sprout and Slughorn, was awoken by Minevra McGonagall's cat patronous, and, still in their night-clothes, went to find out what she wanted. They found McGonagall duelling Snape to the death, and, after squeaking her name in shock, told Snape he would not commit any more murder in the castle. He proceeded to cast a spell which animated the suit of armour that Snape was using to shield himself from McGonagall. Snape then ran into a classroom, chased by Flitwick, Sprout and McGonagall, and flew out of the window, escaping them. Aware that Lord Voldemort would soon attack the castle, Flitwick and the other Professors set to defend the school and the students. He pointed his wand out of the window and cast several intricate protective spells, including Protego Horribilis. Then, he was quizzed over the Lost Diadem of Rowena Ravenclaw by Harry Potter, whom he was shocked to see, under the circumstances. He told Harry that the diadem was long since lost and that it wouldn't really help anyway, unaware that it was a Horcrux. After a brief discussion of how to fight the Death Eaters, it was agreed that Flitwick, McGonagall and Sprout would take groups of over-age fighters up to Ravenclaw Tower, Gryffindor Tower and the Astronomy Tower. Flitwick presumably took his group up to Ravenclaw Tower, since it was a good place to work spells and enchantments. Professor Flitwick was seen fighting Yaxley close to the front doors in the Entrance Hall, just before Voldemort ordered everyone to cease duelling and offered peace in return for Harry Potter. However, battle soon resumed after Harry was thought to be murdered by Voldemort. In the Great Hall, Antonin Dolohov was seen falling to the ground with a scream at Flitwick's hands, defeated and possibly killed. Flitwick also witnessed the duel between Harry and Voldemort in the Great Hall and after Voldemort's spell rebounded on him, Flitwick, Sprout and McGonagall all reached to hug Harry at the same time while everyone else joined in. A celebration feast was later held, but no one sat in their proper places; teachers, parents and students were all jumbled up. It is likely that Professor Flitwick sat by the Ravenclaws, since he was their Head of House. He was seen talking with Horace Slughorn and Pomona Sprout after the battle. It is likely that Professor Flitwick continued his long tenure as Charms Master after the war, though he may have retired sometime before 2017, being as old as he was. Flitwick, due to his goblin blood, was distinguishingly short and frequently described as "tiny little Professor Flitwick". He had a shock of white hair in his elderly years and brown when he was younger. Also when he was young, he usually wore black clothes and suits as opposed to the green robes that he wore in his later years. Flitwick was an emotional fellow, who seemed to have a gentle spirit. During the 1992–1993 school year when Ginevra Weasley was taken into the Chamber of Secrets, he burst into tears, and in 1993's Valentine's Day, when Gilderoy Lockhart called him a "sly old dog", he buried his face in his hands. During one Charms lesson, Neville Longbottom, while fumbling with attempts at casting a Banishing Charm, ended up sending Flitwick sailing across the room; Flitwick accepted this resignedly instead of losing his temper. He was also shown to have a sense of mischief. He sarcastically remarked to Dolores Umbridge that, while he easily had the ability to remove Fred and George's rampaging fireworks, he wasn't sure if he had the authority. He also discretely cheered the Weasley Twin's escape from the school, and left a small patch of the twin's Portable Swamp under the window, which Ron believed he had done as a monument to Fred and George. He also covertly sneaked Harry a Sugar Mice so as to reward him for speaking out about Voldemort in the Quibbler because he couldn't talk about it aloud, murmuring a little 'sh' to Harry afterwards. Nevertheless, he commanded respect in spite of his sensitive nature and small stature. When he encountered Harry Potter and Draco Malfoy on the stairs discussing Harry's new Nimbus 2000, Malfoy treated him just like any other teacher with no hint of the sarcasm he used with Remus Lupin. Despite his small size, Flitwick was a very powerful wizard. Charms: As a Charms Master, Professor Flitwick was capable of using various charms, enchantments and bewitchments, ranging from conjuring simple decorations to the most advanced shield charms. He may have also invented a few of his own spells. He was also able to conjure a non-corporeal Patronus an advanced piece of magic. Duelling: Sometime after leaving Hogwarts, Flitwick became a duelling champion. Though he had not duelled in some time, he was still good enough to help run Severus Snape out of the school, as well as hold his own against Yaxley and even defeat Antonin Dolohov, a particularly fierce duelist himself who had defeated Alastor Moody and killed Remus Lupin. Non-verbal magic: Professor Flitwick also had some skill in nonverbal magic. In 1996 once every student was inside Hogwarts grounds Flitwick cast a barrier on the school gate without saying the incantation. Transfiguration: Professor Flitwick was shown to be successful in the transfiguration branches of Conjuration and Vanishing, creating baubles from his wand to decorate the Christmas Trees and able to vanish a Portable Swamp. Conducting: Professor Flitwick became the Conductor of the Hogwarts Choir during the 1993–1994 school year and taught the choir how to sing Something Wicked This Way Comes and In Noctem. He also led the orchestra during the Yule Ball. Professor Flitwick was kind to Harry Potter and had a good relationship with him. He was so excited to see Harry's name on his register that he fell off of his stack of books with a squeak. He allowed Harry and his friends to talk during classes, as well as play games sometimes. In 1994 he spent the majority of a lesson discussing the "perfect" Summoning Charm Harry used in order to obtain his Firebolt for the first task. In 1998 he helped defend Hogwarts Castle to give time for Harry to find Rowena Ravenclaw's Diadem, casting a Protego Horribilis on the school grounds. He was among the first ones to run and hug him after he defeated Lord Voldemort. Flitwick also had a good relationship with Hermione Granger and Ron Weasley. Hermione was a very good student and thus Flitwick liked her. Flitwick was thoroughly impressed when Hermione managed to successfully cast the Levitation Charm, announcing her feat to the class. He was also friendly with Ron Weasley, who was a friend of Hermione and Harry. Ron liked Flitwick's method of teaching, as he usually let them talk during his lessons. Flitwick fought alongside Ron and Hermione at the Battle of Hogwarts and they all survived the battle. Professor Flitwick was very caring and protective of the members of his House, Ravenclaw, as he is Head of Ravenclaw House. In 1997, when Death Eaters invaded Hogwarts Castle by use of a Vanishing Cabinet, Flitwick was knocked out, but left the hospital wing in a hurry in order to look after the Ravenclaws, despite still being shaky from his attack. At the end of the year, after Albus Dumbledore's death, Flitwick, as well as Minerva McGonagall, Pomona Sprout, Rubeus Hagrid, and Horace Slughorn had to decide whether the school should re-open the following year. He could not decide where his students would be safer, at Hogwarts or at their homes, and wanted to leave the decision to the board of governors, which Professor McGonagall was inclined to agree to. The school did indeed reopen for the 1997–1998 school year, but McGonagall had been replaced as Head by Severus Snape. Alecto and Amycus Carrow, the new Defence Against the Dark Arts and Muggle Studies professors, treated all of the school's students brutally and horribly, aside from the Slytherins of course. Because of this, Flitwick protected the Ravenclaws, as well as the other students, from the Carrows, as did McGonagall, Sprout and Slughorn. Once Lord Voldemort declared war on the Castle, Flitwick fought in the Battle of Hogwarts and survived, so he likely continued to teach and care for the next generation of Ravenclaws. Rubeus Hagrid: "No other headmaster or headmistress ever gave more to this school." Filius Flitwick: "Hogwarts should be Dumbledore's final resting place." Flitwick seemed to have a good relationship with the most of his colleagues at Hogwarts. Some of them were Minerva McGonagall and Pomona Sprout. All three were professors at Hogwarts, while Heads of House. Prior to the Battle of Hogwarts, McGonagall and Flitwick, watched by Sprout and Horace Slughorn, duelled Professor Snape, who had taken hold of the school, ultimately forcing him to flee. Both Sprout and Flitwick exhibited yells of shock at Harry Potter when he unexpectedly arrived at the school, and Sprout and McGonagall fought alongside Flitwick in the Battle of Hogwarts and survived the Second Wizarding War. After the duel between Harry Potter and Lord Voldemort, the three of them hurried to Harry to congratulate him and celebrate. Flitwick may have also been friendly with, or at least unusually persuasive to, Poppy Pomfrey, the school matron, as the strict nurse very rarely let people out of the hospital wing until they made a full recovery, but she let Flitwick out after he was hit by a stunner by Severus Snape, despite still being shaky. This may, however, just be because he was the Charms Master and a professor. Horace Slughorn, the Potions master and Head of Slytherin House, seemed to believe that he was friendly with Professor Flitwick. However, the latter seemed to try to avoid him during a trip to Hogsmeade after he invited him to the Three Broomsticks Inn. Flitwick declined, saying that he had "emergency choir practice" with the Hogwarts choir back at the school. Professor Flitwick, like all the other professors at the school, disliked the Defence Against the Dark Arts teacher of the 1992–1993 school year; Gilderoy Lockhart. Despite Lockhart being a former Ravenclaw, and possibly one of his old students, Flitwick did not have a very good relationship with him. On Valentine's Day, Lockhart suggested to the students that they ask Professor Snape to brew them Love Potions and said that Flitwick knew more about Entrancing Enchantments than anyone he knew. Flitwick responded by burying his face in his hands, while Snape looked like he would force-feed poison to the first person to ask him for a love potion. During the 1995–1996 school year, Dolores Umbridge, the Defence Against the Dark Arts teacher, was made High Inquisitor of Hogwarts. When Umbridge inspected Professor Flitwick's N.E.W.T. Charms Class, he treated her like a guest and was very polite. But when she inspected his rehearsal with the Hogwarts choir, Umbridge measured his height, which he found insulting. When she became Headmistress of the school, Flitwick, along with the rest of the staff and the students, was against her. After Fred and George Weasley released fireworks into the corridors, Umbridge spent an entire day running around putting them out, and Flitwick later said that he could have easily put them all out, but was not sure that he "had the authority" to do so, and then wrapped the conversation up by smilingly slamming the door in her snarling face. The twins also released a Portable Swamp into another one of the corridors, and, once Umbridge had been suspended, Flitwick vanished it in a second, but left a small patch since he considered it to be a good piece of magic. Filius is Latin for "son", and the filius philosophorum, meaning "the philosophers' son" is a symbol in alchemy, sometimes associated with the philosopher's stone. The surname Flitwick may come from the Charms professor's own advice for wand movement: "swish and flick". Flitwick is also the name of an English town, pronounced "Flittick". To flit is to move quickly from location to another. A wick is a loosely woven strand of fabric or fibres, often used in a candle or oil lamp. A wick has a similar shape to a stick (wand). Flitwick is portrayed by British actor Warwick Davis in the film adaptations. Davis also provided the voice of Griphook the Goblin in the film adaptation of Harry Potter and the Philosopher's Stone, and portrayed him again (both physical form and voice) in the film adaptations of Harry Potter and the Deathly Hallows: Part 1 and Part 2. Therefore, Davis is one of the 14 actors to appear in all eight film adaptations. Flitwick's goblin ancestry explains not only why the Professor is so small, but also his great wit and intelligence, which were the reasons for his being sorted into Ravenclaw. Flitwick decorates with live fairies quite a bit, especially during Christmas in the Great Hall. Flitwick's favourite drink is cherry syrup and soda with ice and an umbrella. In the video game adaptation of Harry Potter and the Chamber of Secrets, the Chamber of Secrets speech is given by Flitwick instead of Cuthbert Binns, the History of Magic professor. Strangely, despite her hatred of "Half-breeds", Dolores Umbridge did not seem to hate Professor Flitwick, as the Weasley twins stated that she gave him a good review. However, this may be due to the fact that his "half-breed" ancestry comes from a distant relative. In the film, though, Umbridge is seen measuring his height. 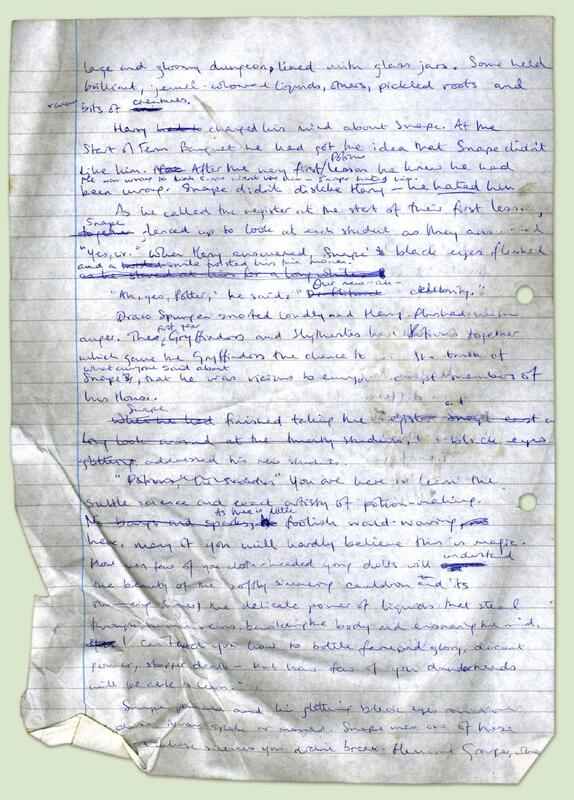 The line "Dr. Flitwick" appears (crossed out) in a page from an early draft of Harry Potter and the Philosopher's Stone. The new look of Flitwick has an item on merchandise, a minifigure by LEGO. In a deleted scene from Harry Potter and the Deathly Hallows: Part 2, Flitwick battles Nagini in the Marble Staircase during the Battle of Hogwarts. Curiously, in the U.S. edition of Harry Potter and the Half-Blood Prince, no mention is made of Flitwick insisting on going off to look after the Ravenclaws or him having been knocked out, only that he was "hurt." Flitwick's appearance in the film adaptations is sporadic. His only major scene in the film adaptation of Harry Potter and the Philosopher's Stone is during the Charms lesson where he teaches the spell Wingardium Leviosa. Flitwick was written out of the film adaptation of Harry Potter and the Prisoner of Azkaban; however, Warwick Davis was offered a small part as the conductor of the Hogwarts chorus appearing as a small man with brown hair and moustache, identified in the credits only as "wizard". Despite Warwick's appearance as a conductor in the film of Prisoner of Azkaban, in the video game version of Harry Potter and the Prisoner of Azkaban Flitwick appears as a teacher, and his physical appearance is as it was for the first two films and first two video games. This same character reappeared in the film adaptation of Harry Potter and the Goblet of Fire although now identified as Professor Flitwick. According to interviews, director Mike Newell liked the look of a younger Flitwick. In the film adaptation of Harry Potter and the Order of the Phoenix, he is seen in a Chorus Class in the Great Hall. He is seen again cheering when Fred and George Weasley depart Hogwarts. In the video game adaptation of Order of the Phoenix, Filius Flitwick is seen with his new look in his class. Filius, with his post-Chamber look, is finally confirmed on-screen in the film adaptation of Harry Potter and the Half-Blood Prince. He also displays a far more prickly demeanour than in Philosopher's Stone. Flitwick's physical appearance in the first two films is credited as the teacher and his physical appearance in Harry Potter and the Half-Blood Prince merchandise (The Annual 2009 Poster Sticker Book) also uses the elder Flitwick, although the packaging of the LEGO figure uses the younger Flitwick. Also, Warwick Davis who plays Flitwick believes himself that the two characters (Conductor and Teacher) are different people but perhaps related. However despite Warwick Davis believing this, in the film version of Harry Potter and the Half-Blood Prince, Harry confirms them both to be the same character in a conversation with Flitwick, and in Harry Potter and the Deathly Hallows: Part 2, Professor McGonagall calls him "Filius", as does Professor Slughorn in the Harry Potter and the Half-Blood Prince film. Flitwick slightly turns back to his previous appearance during the Snape's memories scene, in which he is seen clapping in the Sorting ceremony. Popular in-universe explanations for the change in appearance are that he decided to get a makeover, or that he was involved in a magical accident resulting in his change in appearance. However, without any on-screen or in-print confirmation, the discrepancy remains a mystery and it has caused confusion amongst viewers and a rather large inconsistency. It has also been noticed that Flitwick's role as from the fourth film, has been used for comic relief, due to his snappy personality and unexpected, comical behaviour (e.g. his contribution to the cheering when the Weasley twins left Hogwarts; the conversation between him, Harry and Luna in the sixth film and his flight from the Viaduct when the Giants close in during the Battle of Hogwarts in the second part of the seventh film). ↑ He cannot have been Muggle-born because he was at Hogwarts during the 1997–1998 school year, but he could not have been pure-blood because of his goblin ancestor. ↑ JKR stated that Flitwick has a "dash" of goblin blood. ↑ In order to be a Head of House, that person must have been a member of that House, so Flitwick attended Hogwarts as a Ravenclaw. ↑ Harry Potter and the Deathly Hallows, chapter after the "Grey Lady conversation". ↑ As he was teaching by the seventies. ↑ Harry Potter Lexicon - "Harry Potter and the Half-Blood Prince - Differences"
This page was last edited on 8 July 2015, at 09:25. This text is available under the GNU FDL and may have been adapted from the Wikipedia article about Filius Flitwick (history).